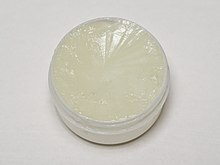 Petroleum jelly, petrolatum, white petrolatum, soft paraffin or multi-hydrocarbon, CAS number 8009-03-8, is a semi-solid mixture of hydrocarbons (with carbon numbers mainly higher than 25), originally promoted as a topical ointment for its healing properties. After petroleum jelly became a medicine chest staple, consumers began to use it for a myriad of ailments as well as cosmetic purposes, including toenail fungus, genital rashes (non-STD), nosebleeds, diaper rash, and chest colds. Its folkloric medicinal value as a "cure-all" has since been limited by better scientific understanding of appropriate and inappropriate uses. It is recognized by the U.S. Food and Drug Administration (FDA) as an approved over-the-counter (OTC) skin protectant, and remains widely used in cosmetic skin care.